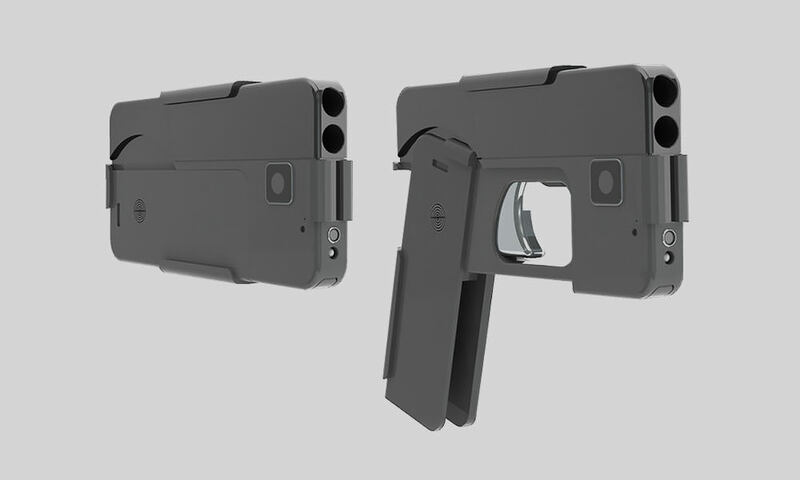 It’s a CCW first: a collapsible derringer designed to look like a smart phone. Ideal Conceal, a Minnesota-based company, is a newcomer on the firearms scene, having incorporated in October of 2015. But in that short space, they’ve made a huge splash. Concealed carry is a subject guaranteed to elicit a strong response, and Ideal Conceal’s derringer got more than its share of attention. Rumors abounded that the weapon was designed by criminals as a means of fooling and potentially murdering police officers. While there’s no truth to this, the misinformation spread so widely that the urban legend experts at Snopes.com had to get involved. Their research confirms that Ideal Conceal’s derringer is intended for those who wish to carry legally and discreetly—the word “soccer moms” got thrown around a bit. So, like the infamous Glock 7, we can safely slide that conspiracy theory into the dustbin of internet rumor. With the myths out of the way, what do we know about this thing? At the time of this writing, the answer is “not much.” The action is hammerless. It’s chambered in .380 and holds two rounds. It opens when you disengage the safety—so there’s a safety. Beyond that? I can’t find specs on materials or dimensions—though from the website photos I’d guesstamate that it is about smart phone sized. The marketing materials describe the design as “light weight”, though the actual weight isn’t given. As things stand, there doesn’t seem to be a working model available for either display or review. I suspect that Ideal Conceal is still at the concept phase—their social media claims that the weapon will be available for sale in mid-2016. So while I can’t give my opinion of its quality or functionality, I can share my thoughts on the concept—and the concept is solid. Ideal Conceal has built on a long tradition of hiding weapons in plane sight, and cleverly zeroed in a key piece of camouflage for 21st century urban living. The design seems simple enough to be reliable—I especially like how the trigger is completely enclosed until the weapon is deployed. Assuming some acceptable level of quality, it’s priced to move with an MSRP of $395.00. And the patriot in me really likes that it’s Made in the USA. All that having been said, does the Ideal Conceal derringer have a place in the CCW world? Again, without having handled one, my best answer would be “sort of”. I can see this as a backup or holdout weapon—it would be brilliant for undercover law enforcement. However, like all derringers its limited in function; two rounds of .380 only do so much. They’re meant to be carried a lot, shot a little, and to be a weapon of last resort rather than a primary carry piece. With those limitations in mind, I’ll seriously consider buying one as a back-up when the opportunity presents itself. My only real concerns are those of mindset. Designs like this make it easy to skirt restrictions on weapons, be it the law of the land or company policy . While CCW permit holders are some of the best behaved citizens in this nation, I’ll remind you that with the permit comes the responsibility to follow the law. And, as with all CCWs, keeping the weapons secured—particularly around children—is a must, as is following the rules of gun safety at all times. I’m looking forward to seeing more from Ideal Conceal. If any of our readers have direct experience with them, please reach out via email or in the comments section. Until then, stay safe out there.